I began this series of posts on my research trip to Kangding (康定) in Shanghai, but the trip actually began with a visit to a quiet corner of a leafy churchyard in Kent. A week or two before setting out for China I took a train from London Bridge to Hildenborough, not far from Tonbridge. The village of Hildenborough is a short walk from its railway station, and Saint John's Church is one of the first buildings you come across on the main road through the village. Passing through an ornate lych gate, the roof beams of which were decorated with garlands of local, dried hops, I looked up at what is a solid and imposing building with flint walls, tall windows, and a tower topped by an impressively tall spire. The two heavy wooden doors to the church stood open and I could hear music gently wafting out from the organ being played inside – it was evident from the various people arriving and already bustling about that preparations were underway for a wedding. The fact that Rinchen remained a devout Buddhist perhaps explains the situation of her grave, which is tucked away at the far end of the churchyard. For a long time her gravestone must have stood alone in that shaded corner. The closest graves nearest in date are generally some fifteen years later, and it wasn’t until twenty years after her passing that Louis was finally laid to rest with her.There’s nothing at all remarkable about their grave now, and, unless you went looking for it as I did that bright summer’s day, there’s nothing which would mark it out as in any way different from those around it. When they arrived in Britain on August 11th 1925 at London’s Victoria Docks having sailed from Yokohama (or perhaps joining the ship at Kobe) on the Japanese steamer, Kitano Maru,sailing via Shanghai, Singapore, Suez, Marseilles, Gibraltar, Moji and Port Said, they lived first in Kensington before moving to the countryside at Hildenborough. The house in which Louis and Rinchen made their home, called ‘The Yews’, still stands at the edge of the village at the end of a quiet lanelined with tall, old oak trees. Rinchen’s brother, Namka Dendru (Namkha Tendruk) accompanied them, intending to study engineering. He returned to Khamin 1932-3, where contemporary newspapers indicate he was quite a prominent citizen, at different times acting as a guide and interpreter to a team of Chinese scientists (geologists, biologists, and sociologists); a Swedish botanist; and, a German Consul – all of whom made various research trips at different times in the borderland regions. One of Namka’s claims to local fame which made it into the papers was that he shot “a magnificent black bear quite near the road outside Jedo” (it was thought that this bear may well have returned with the Swedish botanist to Upsala in Sweden, and one can’t help wondering, if it was stuffed, whether it still stands in some museum display case there!). Interestingly, another newspaper report states that, unlike Rinchen, Namka converted to Christianity whilst he was living in Britain. As yet, I’ve not managed to find any information as to how long Namka lived or when he died – but his life certainly seems no less interesting or eventful than that of his sister. Records of births and deaths are often key sources for genealogists and historians tracing personal histories. Curiously enough it was just such a document which in-part spurred my initial researches into the lives of Louis and Rinchen; and it was also this same document which lead me to staying an extra day than I’d originally planned in Kangding (དར་རྩེ་མདོ། Dartsendo). Around ten years ago I was asked to see if I could assist in getting a very fragile Chinese document translated. There was a vague idea amongst the family that this document might be “the deeds to a monastery or a mountain.” This idea was not too far from the truth, as it turned out that the document was in fact a ‘deed of purchase’ to a plot of land ‘5 zhang and 1 chi in circumference’ (approximately 60 English feet) on the ‘shaded’ (廕庇) side of a mountain at a place named ‘Ci Ma Tang’ (次馬堂). The piece of land which belonged to a Mr Bao Guangming was sold for ‘10 large foreign-style dollars’ (i.e. – imported Mexican silver dollars) to ‘Lang-Ka-Deng-Zhu’ – the Chinese phonetic rendering of Namka Dendru – to own in perpetuity and enclose with boundary walls as a burial plot for his parents.The only other name recognisable on the deed is that of a Mr He Jianbin, presumably a witness. The deed is dated: ‘Republic, 9th Year, Lunar Calendar, 10th Month, Beginning of 10th Day’ . The deed also has a handwritten text in Tibetan as well as a number of Tibetan and Chinese seals, including that of Kangding County (康定縣印). I happened to mention ‘Ci Ma Tang’ to Kris Rubesh (owner of the Zhilam Hostel in Kangding) on my last morning whilst I was having breakfast (after which I was planning to head down to the bus station to take a bus back to Chengdu). Kris suggested we go and ask his neighbour, Mr Lao, if he knew or had ever heard of ‘Ci Ma Tang’. Two minutes later we were outside talking to Mr Lao, his wife, and a number of other older Chinese folk – all of a sudden they seemed to light up and there was plenty of pointing and animated discussion. I could hear them all shouting the name ‘Ci Ma Tang’ over one another. After what seemed like a bit of confusion they all finally came to agree that ‘Ci Ma Tang’ wasn’t too far away. Apparently it was somewhere near the hot springs at Erdaoqiao (二道桥温泉) in a nearby valley. Their best advice was that I should go there and “ask someone reallyold” exactly where ‘Ci Ma Tang’ was! … This was interesting though – as, whilst I understand the name might not necessarily infer a direct meaning, it does appear to suggest some kind of stopping place or building associated with horses – which chimed with me in that I’d read mention of horse racing in connection to religious festivities which used to be held at Tachienlu (Dartsendo); similarly Kris said that horses were used today for taking tourists up and down the mountains in summer and that these horses were put out to pasture near Erdaoqiao in the winter. The hillsides were all quite densely forested, one of which – not far out from Kangding – bore a huge fresh scar of a landslide which had exposed an enormous expanse of clean, fresh slate rock which was extremely iridescent and was quite blinding at times when it caught the sunlight. A few of the hillsides were dotted with strings of prayer flags. I wondered if some of these might be associated with the small burial plots which I’d been told dotted many of the hillsides around, I’d seen some of these at closer hand on the slopes above Kangding. Maybe one of these still marked Rinchen and Namka’s parents’ final resting place, or perhaps all trace of their grave had long since been swallowed up by the trees? I decided to press on as far as I could to see what there was to see along this old route to Tibet, and apart from the neatly metalled road the further I went the more it seemed like little had really changed since Teichman and King and their contemporaries used to travel this way. There were still plenty of stone walled farm houses and little hamlets. As I walked almost every passing vehicle stopped to offer me a lift and then seemed to marvel at the mad Englishman indicating that he was happy to walk! … Everyone I met along that road seemed cheerful and friendly, and the few words of Chinese which I’d become accustomed to using in answer to the same friendly enquiries, describing myself and where I was from (“Yīngguó” 英国), seemed to satisfy their curiosity. In one hamlet I was greeted with by a small crowd of giggling children all saying “Hallo”, and grinning from ear to ear when I said “Hallo” back; and then, further on, passing through another hamlet, a smiling group of weather beaten women with traditional Khampa hairstyles returning from their fields stopped and asked me where I was from. Each rise in the road seemed to entice my feet ever onwards, proving that old allure of wanting to know what might lie just beyond the horizon. Having timed myself out in order to calculate when was best to turn back (factoring in the negative value of my aching feet) I constantly found myself allowing “just one” more bend or rise in the road – just one more, just one more, and then another ... Eventually I reached a very weather-worn white monument and decided that this was a good marker point at which to stop and reluctantly turn back. Hoping that some day I might get the chance to return here and continue on to what I’ve heard is a very beautiful lake at the far end of the valley, and maybe then even further beyond – to Derge and Chamdo. I would very much like to go back at some point and try to re-trace some of Louis’s journeys. When I got back to Kangding I crossed the river and climbed up the hillside to see a small monument (similar to a ལབ་རྩེ།labtse) set in a low walled enclosure which was festooned with prayer flags that were fluttering in the constant breeze. On my way back down I was hailed by a smiling old Khampa woman. Seizing the chance, I tried to ask her about ‘Ci Ma Tang’ – there then followed a strange kind of mime show between the two of us in which, talking in Tibetan, she did her best to dissuade me from climbing the mountain whilst miming with her fingers someone climbing up and then falling down, pointing up at the mountainside (even though I was already safely back down on the flat ground!) all because a foreigner had fallen off the top only a few days before. I nodded as I knew this already because the young lad in question was staying at the same hostel as me, where he was now resting up, nursing a broken ankle. I took out my pictures of Louis and Rinchen, and, showing them to her, I tried to see if she’d heard of Louis or Rinchen, or ‘Ci Ma Tang’? My small stock of Chinese phrases all failed me here, and, to be honest, I got the feeling she probably didn’t speak much Chinese anyway. After looking at the pictures for a while she handed them back, looked at me, and shrugged sadly – and then, to my complete surprise, she said “sorry” in English! … We smiled, I said “Thuk-je-che” (ཐུགས་རྗེ་ཆེ།) “thank you” in Tibetan, and we waved goodbye as we parted. I had no idea what I might find when I first set out for Kangding. I’d certainly not expected to find ‘Ci Ma Tang’, and so I was amazed that I’d got this close to almost finding it, and at the very last moment of my trip too. My journey though had begun at a grave on one side of the world and ended with another on the other side. And so, when I returned to Britain, I took the train once again, on another sunny summer’s day. Walking back down the leafy Kentish lanes to the little churchyard in Hildenborough, where I placed two small mementos of my trip by the headstone in the corner. A small shard of iridescent slate from Paoma Shan (Dentok Ri) and a fragment of roof tile from old Tachienlu (打箭爐). Connecting two places and two points in time together once again. Rinchen Lhamo was born on August 18th 1901 at Rayaka in Kham (which I think might be present day Xinduqiao, 新都桥). She suffered tuberculosis and died on November 13th 1929. 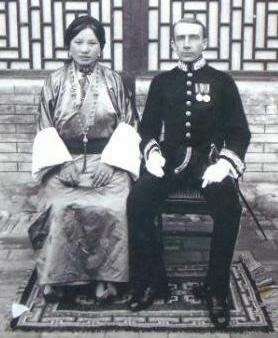 Louis Magrath King was born on December 16th 1886 at Kiukiang (九江 Jiujiang) and died on his 63rd birthday, December 16th 1949. A year or two after Rinchen Lhamo passed away Louis remarried. A photograph of his second wife can be seen here. The list of Incoming Passengers compiled by the Board of Trade for the ‘SS Kitano Maru (Nippon Yusen Kaisha Line)’ does not detail whether the family boarded at Yokohama or Kobe, but a Japanese stamp in their passport is that of Hyogo Prefecture. Three years before, on October 8th 1922 Albert Einstein and his wife, Elsa, sailed to Japan from Marseilles on board the Kitano Maru. Photographs of Einstein posing on deck with a life ring bearing the ship’s name can be seen in: Josef Eisinger, Einstein on the Road, (Prometheus Books, 2011). 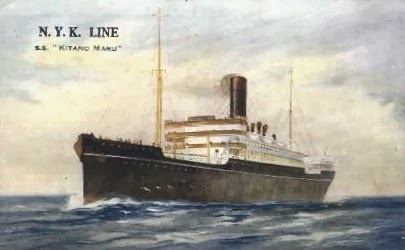 Built in 1909, the Kitano Maru was twice mentioned in The Times newspaper, first on December 6th 1915 when it ran aground at North Shingles, near Margate, and was assisted off by two tugs; and then again on August 14th1928 when it collided with another liner (the Otranto) in the North Sea, an accident in which a Japanese seaman from the Kitano Maru was injured and later died at Hull Infirmary (another report seems to indicate that two seamen died). The ship was repaired in dry dock at Hull. The Kitano Maru was eventually lost whilst working as a transport/cargo ship off Luzon in the Philippines (at Mabilao, Lingayen Gulf, 16º 10’N, 120º 24’E), sunk by a Japanese sea mine on March 27th 1942. Rinchen and Namka’s father was named Pade Jangtso. Special thanks to Kate Down who translated Namka’s ‘Deed of Purchase’, and to Robert Bickers, who helped me trace some of the Chinese newspaper reports regarding Namka Dendru. Thanks also to Andrew Quintman, Michael Sheehy, and Sam van Schaik.